A phished Apple login site on EA.com. An Electronic Arts website was hacked in a phishing scheme aimed at the acquisition of Apple IDs and credit card numbers, security researchers reported Wednesday. Security vulnerabilities in a calendar application are probably what enabled attackers to compromise an EA server and create a phishing site designed to look like an Apple login page, said researchers at Netcraft, a U.K.-based security services company, in a blog post. The site looked legitimate. "My Apple ID" appeared at the top, underneath a toolbar with links to various Apple services such as iTunes and Apple's online store. 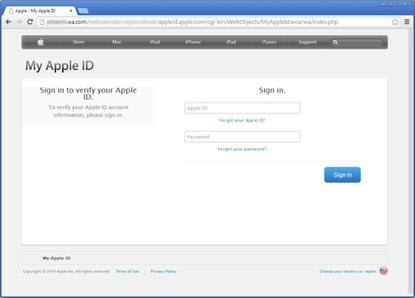 The site asked people to sign in to verify their Apple ID, seeking their Apple ID and password. A second form then asked for the person's full name, credit card number, date of birth, phone number and other information. After submitting those details, people were directed to Apple's actual ID site, Netcraft said. The security company alerted EA to the problem on Tuesday and it has since blocked access to the site, Netcraft said. "We are making sure such attempts are no longer possible," an EA spokesman said. EA did not say how many people, if any, were tricked into submitting their Apple IDs and other information on EA's site. EA is a large company that develops and publishes a range of video game titles, including "Madden NFL," "The Sims" and "Need for Speed." The company is generally not associated with Apple, making it a curious candidate for hackers seeking Apple IDs. Through the attack, the hacker installed code on EA's server, Netcraft said, probably to view the contents of EA's calendar application as well as other source code and data. The attacker may have used the calendar's vulnerabilities as an entryway to go deeper into EA's network. "The mere presence of old software can often provide sufficient incentive for a hacker to target one system over another, and to spend more time looking for additional vulnerabilities or trying to probe deeper into the internal network," Netcraft said. EA's servers came under attack earlier this year under a separate attack targeting users of its Origin distribution software, the security company noted. Netcraft did not say who might have been behind the attack, or what other data might have been accessed. It didn't immediately respond to requests for more information.